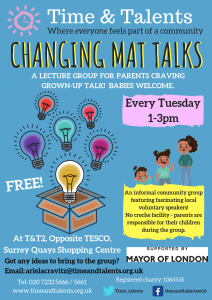 Starting January 15th at 1pm at T&T2 – Surrey Quays shopping centre. A a schedule of interesting speakers on topics from the arts to wellbeing. Do get in touch if you’d like to give an informal talk on a topic you love for the group!